Traditionally, companies have had to choose between speed and security. advantage of continuous development practices and security without impacting delivery speed. Traditionally, security has been an afterthought. But backpedaling security into existing processes, applications, and environments causes headaches and inefficiency. Instead, integrate security as early as possible by prioritizing visibility into who is doing what, where and when to know exactly what is happening across your AWS environment. Gaining visibility across your AWS environment is fast and easy when you use a solution that is built for AWS. Threat Stack’s cloud-native platform deploys across an organization’s entire AWS environment in minutes, providing visibility that scales as you grow. This makes security visibility manageable even for the smallest of teams. Security of the Cloud: AWS is responsible for the security of the cloud itself. Security in the Cloud: You’re responsible for implementing security in the cloud. Security should grow with you, and with minimal intervention. This is especially necessary for agile startups that lack security personnel. It’s important to select a security solution that can auto-scale, meaning that the solutions can grow with you in the cloud and can auto-deploy coverage as new servers spin up, monitoring any number of users and networks. When embedded in the cloud as early as possible, security can scale seamlessly. 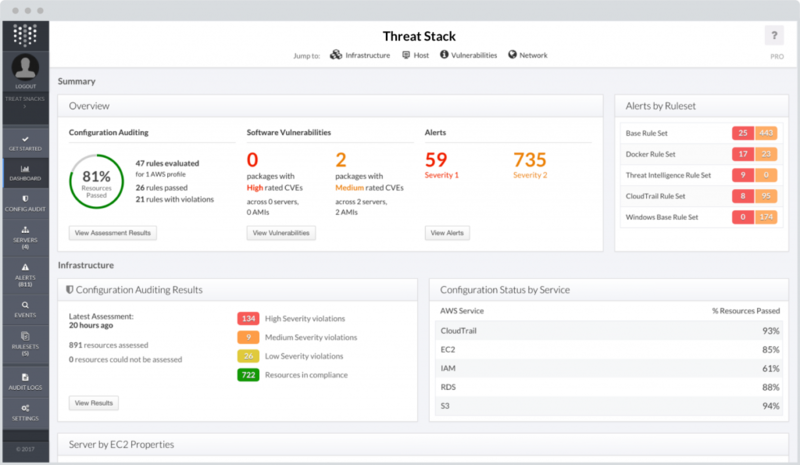 Check out Threat Stack to learn more about getting started with securing your AWS environment.